Alligator weed, photographed at Green Cay Nature Center, Boynton Beach, Palm Beach County, in August 2013. Thank two tiny bugs that alligator weed, Alternanthera philoxeroides, isn't a bigger problem than it already is. 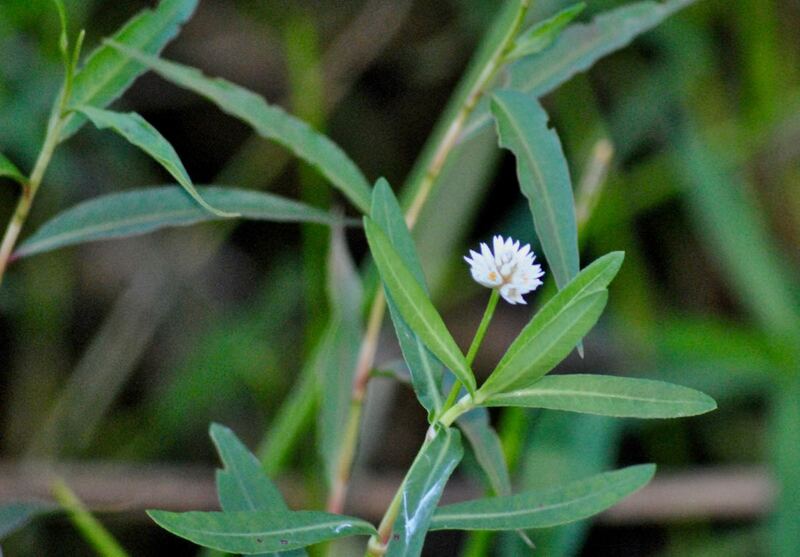 Alligator weed is a plant of South American origin that made its way to Mobile, Ala., in 1897, most likely as a stowaway in a ship's ballast accidentally dumped in state waters. It's now found throughout the Southeast and, surprisingly, as far north Illinois. It's also spread to Australia, Asia and parts of the Pacific, where it invariably becomes a herbaceous pest. It can form sprawling mats over rivers or along shore lines, but it can also grow on dry land. Its leaves are elliptical to oblong in shape and grow opposite each other along the stem. The outer edges of the leaves are smooth. The stems themselves can exceed 30 feet in length. It blooms during summer, the flowers tiny, white-and-yellow, clustered on a head the size of a marble. Alligator weed apparently does not reproduce via seed in North America but rather vegetatively. It has nodes along the stems that where roots and new stems grow. Break off a piece and you've got a new plant. By contrast, according to the authoritative Flora of North America, neither the fruit of the plant or its seed has been observed. 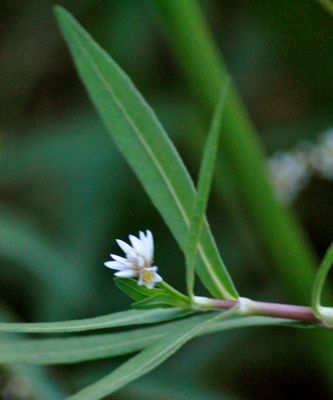 Alligator weed is listed on Florida's prohibited aquatic plant list, and as a Category II invasive. That means it growing in abundance but not enough to have altered habitats. Yet. 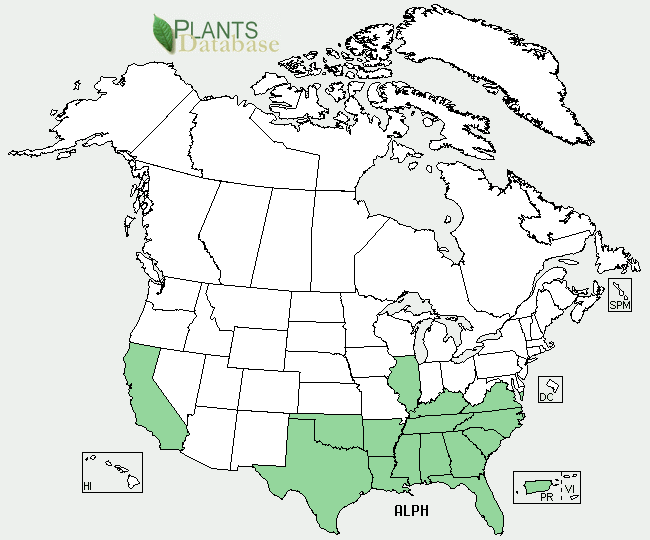 Which brings us to the heroes of our story: the alligatorweed flea beetle, Agasicles hygrophila, and the alligatorweed thrip, Amynothrips andersonii, both released in the U.S. back in the 1960s. Both bugs are native to southern Brazil and northern Argentina and both feed exclusively on the leaves of alligator weed. Left uncheck, alligator weed will form large, dense mats that can choke navigation, clog drain and intake pipes, limit light penetration and block out native species. Waterways can become unuseable for boating, fishing and swimming. By decreasing water flow, it increases the amount sediment in the water and provides breeding places for mosquitos. When it grow on land, it can invade farm fields and become and agricultural pest (and potentially clogging irrigation ditches). Australia considers alligator weed to be a "high risk" invasive despite an aggressive effort to limit its spread. In China, it's ranked as the country's 12th worst invasive; in some parts of the country, it's reduced rice production by 45 percent and sweet potato by 63 percent. Part of the reason why alligator weed is such a problem is that it is one tough, adaptable plant. It will grow in water, it will grow on land. It will tolerate a fair amount of salt. It will also tolerate cold to a degree, dying back come winter in colder climates. By the way, the alligatorweed flea beetle is ineffective on alligator weed when it grows on land. It's also nutritious when cooked as a green, full minerals and a fair share of protein. However, it also tends to pick up any toxins that might be present in the water, including heavy metals. 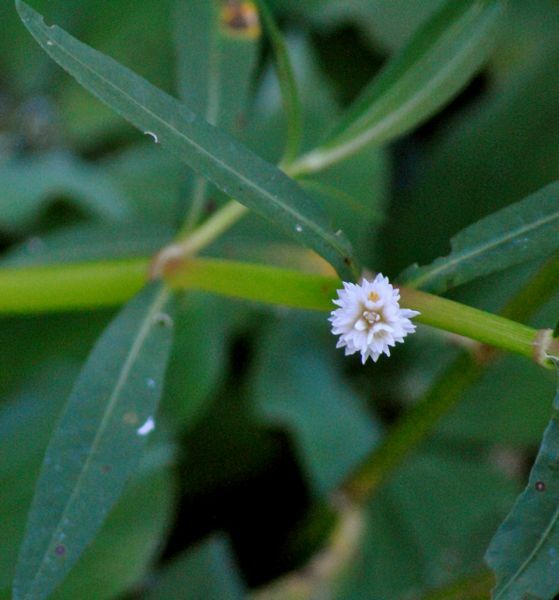 Alligator weed, also spelled alligatorweed, is a member of Amaranthaceae. United States Department of Agriculture (USDA) distribution maps for alligator weed.